What is the natural life span of a combination lock? I’ve had the one I’m using for a couple of decades. A few months ago, it started to give me trouble. The internal notches weren’t immediately aligning when I got to the last number. It felt sticky. I worried. I’d run the combination again and again, until it took. It always took . . . eventually. I didn’t go out and buy a new lock, mostly because—get this—I like the combination. Ah, the combination, which came unbidden, attached to this particular lock, a lock I picked up god knows where 20 years ago to use in a downtown DC gym. (At least I think that’s when and why I got it. If not, it’s even older than I think it is.) This combination of three numbers is a completely arbitrary set—but the first two mean something to me. It’s almost as if someone chose a hard-to-guess PIN especially for me, then bestowed it upon this lock. Lately, the problem with the last number seems to have corrected itself. The lock has been opening smoothly. But for how long? Should I worry about the day when I might need to saw the thing off my gym locker? I really like the combination. Slippers. Boots. Slippers. Boots. Slippers. Boots. The occasional ice skates. Boots. Slippers. Boots. Asics (for the gym—actual shoes, with real laces and everything!). Boots. Slippers. Boots. Slippers. December 5: Purchase cut balsam to act as holiday tree. Place in tree stand in living room. String lights around it (eventually—see previous blog entry), just in time to host dinner party. December 5–January 10: Allow tree to stand through twelve days of Christmas, Epiphany, and dinner party on 9th for friend turning 70. Plan to take tree down on 10th to haul to neighbor’s tree-burning party. January 10: Collapse in heap after tasks of dinner party and hosting houseguests for weekend. Turn on tree lights and read on couch. 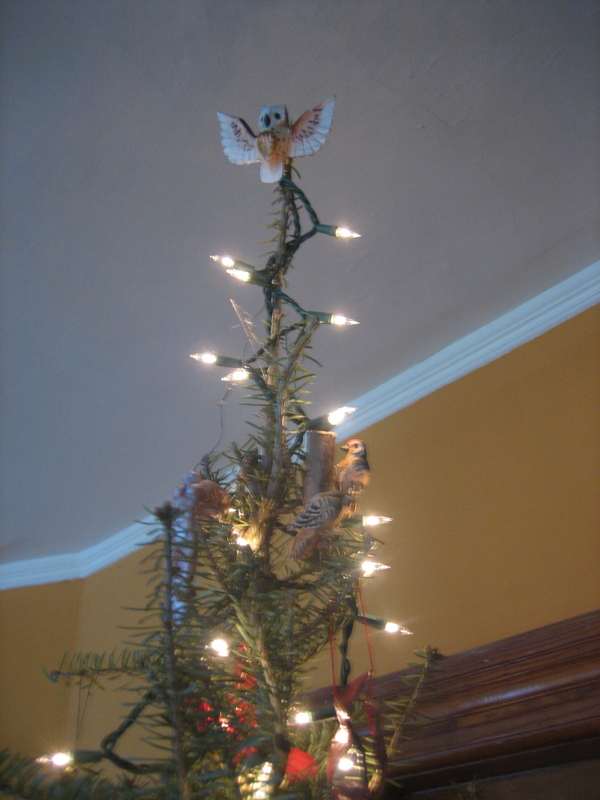 January 11–15: Plan to remove ornaments one night after work before next weekend full o’ houseguests. Allow self to be dissuaded by combination of laziness, fatigue, and husband claiming niece and nephew might like to see ornaments, despite lateness of season. January 15–18: Houseguests. Tree still stands. January 20: After work, remove ornaments. January 22: After work, remove lights. January 23: Take tree to transfer station, where we believe it will be mulched. Subjected to ridicule by friends as we make stop at post office, tree lashed to roof of car. January 23–??? : Vacuum furiously and transfer holiday boxes to attic. The scene: I am strapping my 7-year-old niece into the back seat of my car for the ride home from the artisanal cheese/goat farm. J: Do you take a pill to not have babies? J: Sometimes people who stop can’t have babies right away. Me: That’s right. Sometimes there’s a delay if you take the pill. Sometimes you get pregnant right away. And some people might not ever get pregnant—but they might not have anyway. J: Some people can’t afford to have their babies and they give them up. Me: Yes. And that is good for people who really want to have babies and can’t. She never asks why I don’t have a baby. A particular late-summer afternoon in the early 1990s found us leaving the beautiful Adirondack mountains to return to our real lives in DC. Departing from our beloved vacation spot was especially depressing in the days before we lived in Vermont, what with the long drive and facing some of the harder aspects of city life. Winding our way into lower elevations, we partook in annual heading-home rituals. One of these was a stop at a particular gift shop. This shop sells everything from furniture to clothes to art to home accessories. Sometimes there are one-of-a-kind pieces there. This time there was a big wooden fish—an old fish sign, in fact. Painted on each side was the word COD. Except, on one of the sides, it almost seemed like a serif was creeping into it. It looked kind of like GOD. It was expensive enough to be rejected as an impulse buy at the end of an expensive-enough vacation. We got into the car and continued our journey south. Five or ten minutes into the drive, I said, “But I really liked the God Cod.” Tim immediately turned the car around, and we bought it. 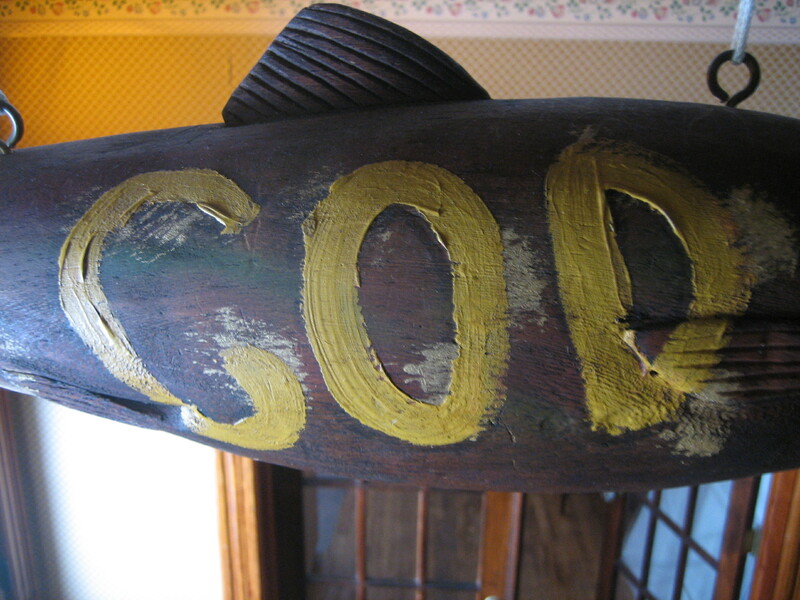 In our apartment, the God Cod hung over the kitchen sink, in front of a window, probably God-side-out. 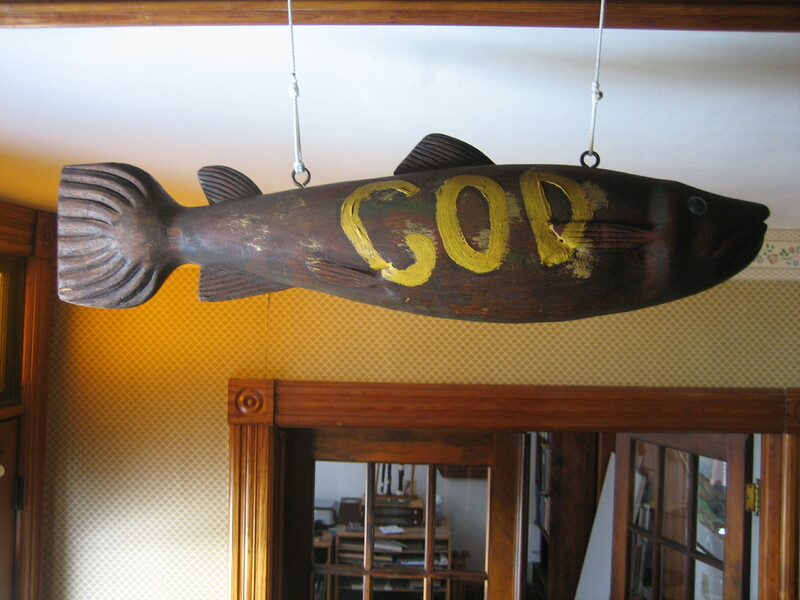 When we moved to Vermont, Tim hung the God Cod from an exposed ceiling beam that separated the kitchen from the dining area; this way, you could see both sides. 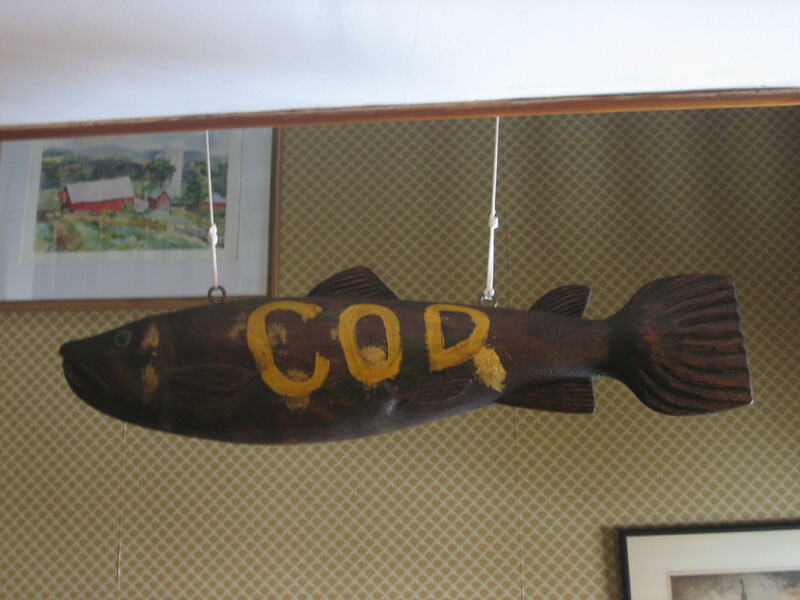 When we bought this house (across the street from our old house), it took us a little while to figure out where to put the God Cod, but eventually it found its home along the staircase, hung from the balusters of the banister above. When I descend, before I hit the landing, I often give the God Cod a nudge, whereupon it swims.
. . . look like this either, but Fat Red Ant (remember her from 365?) 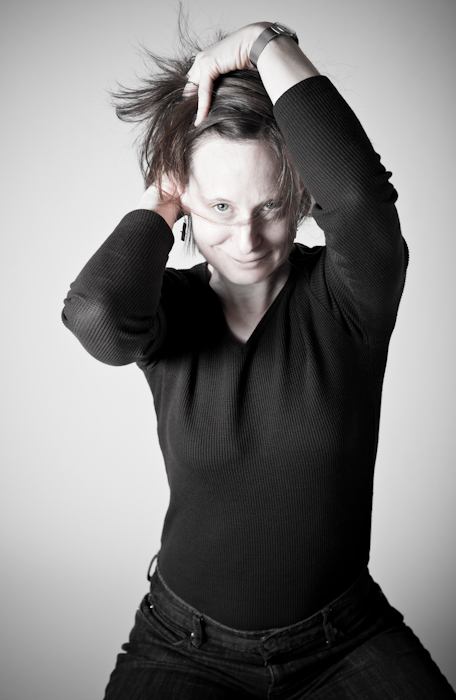 managed to create this image with her impressive skills, sense of humor, and some Photox. But you are no more likely to recognize me on the street with this as your guide than with the image posted Outside. Sometimes one needs to test the doneness of a baking thing before it comes out o’ the oven. 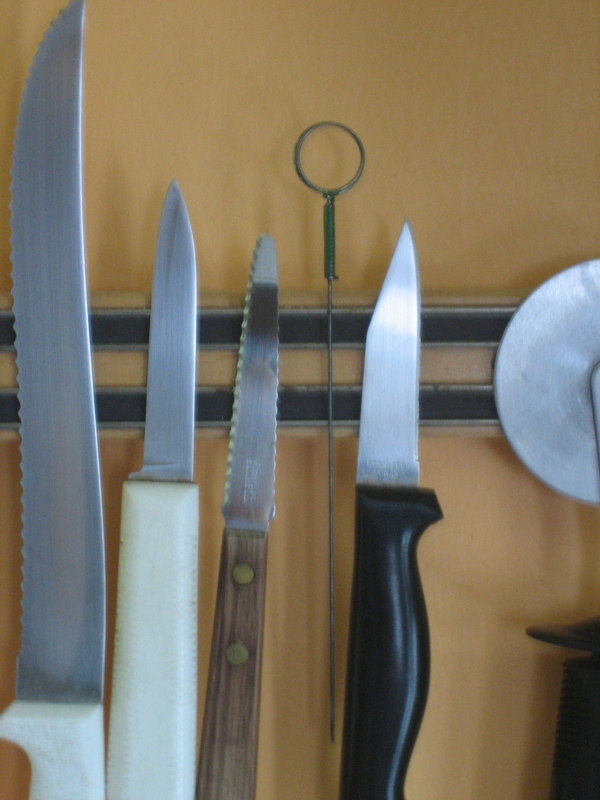 There are tools for that: Some people use toothpicks; others use metal cake testers. When Tim and I went to buy a cake tester many many years ago, we bought one adhered to its own presentation cardboard, proclaiming it to be a Modern Cake Tester. It being the 1980s, that completely cracked us up. We have never used the Modern Cake Tester without announcing that we were doing so, calling it by its full name. It used to reside in that catch-all utensil drawer that every kitchen has, and often the initial announcement of its use would come when one of us was banging through that drawer screaming “Where’s the Modern Cake Tester?”. Usually we’d find it. But its skinniness could make it extremely elusive. 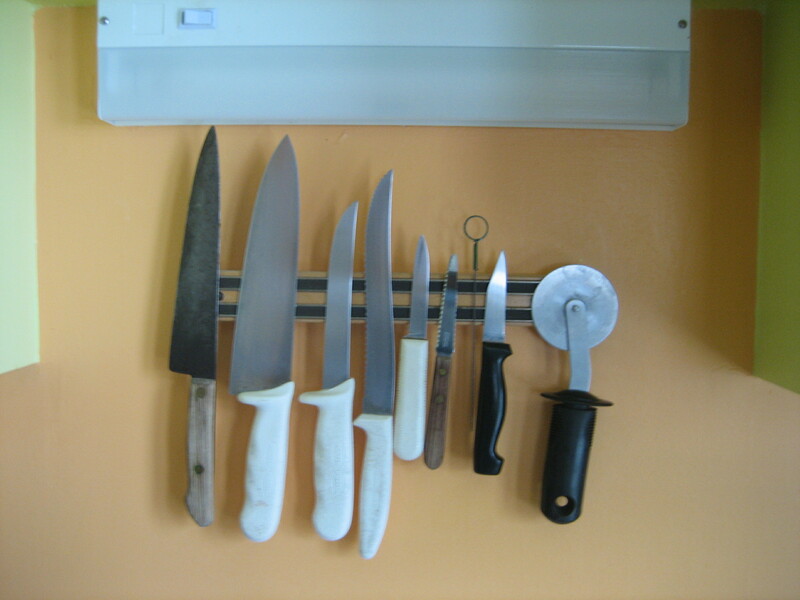 At long last, someone got the bright idea to keep the Modern Cake Tester on the magnetic strip on the wall with the OK-knives (as distinguished from the “good” knives, which are pretty good, but likely would never be considered “great” knives). That magnetic strip is a fine home for the Modern Cake Tester. Here it is. He’s the third guy in from the right, two over from the pizza cutter. What’s in a name? That which we call a Modern Cake Tester by any other name would test as clean at doneness. But would I love it so? I am very lucky that Tim and I are so compatible and happy together. It’s something I think about every day. I swear, I do not take it for granted. Years ago—likely close to a couple of decades ago—we both fell in love with a bottle opener. 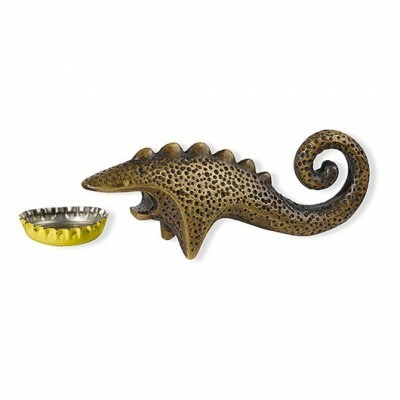 A bronze lizard bottle opener. This little sculpture seemed ridiculously expensive to us, but it was solid bronze, after all, and did I mention that we loved it? When the store in which it resided was on its last legs, we finally yielded to our desire. I can’t remember if the bronze lizard bottle opener donned a going-out-of-business price tag or if we simply panicked and thought we’d never see it again. But cough up the dollars we did, and it was ours utterly. At long last, the winter gods have turned their heads toward Parts West and blessed us with snow, the right kind of snow, the kind that makes us want to go out and play. Two days after Christmas, it was 40°F. I took a walk on our beloved rail trail. Too early for January thaw, the world was giving it a try anyway. It smelled like March, all muddy in places, the late-afternoon light breathtakingly beautiful and warming. Ducks flew over me in twos and threes, then met up to fly together in a flock of forty or fifty over the puddly field, eventually splashing into a nearby bend of river to spend the night. The next day it snowed. Tim and I took the same walk. The world was utterly changed. A little snow fell here and there through New Year’s Eve, but by New Year’s Day, things were getting more serious. It has been snowing almost nonstop for two days. Yesterday we loaded our snowshoes into the car and drove down Route 153 a few miles. We met up with friends, slapped on our shoes, and took a glorious hike through fields, over hills, past a long-neglected apple orchard and a well-tended sugarbush. Shayne, the border collie, looked her most absolute beautiful running through nearly (to her) chest-deep drifts, snowspray surrounding her black-and-white agility like a halo. We ran down a long hill, leaning back into our snowshoes, practically bouncing. Snowflakes kept getting in my eyes, sticking to my lashes. I opened my mouth, thinking that a much bigger surface area would collect more flakes than my eyes could. It was only a theory. 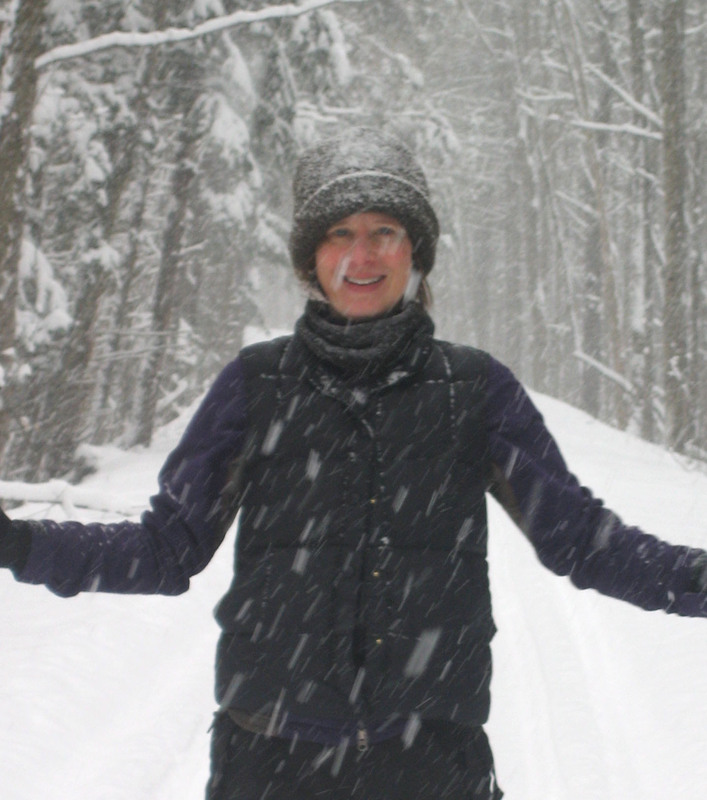 Today we took to the rail trail for our first cross-country ski of the season. Heading into New York the trail is sheltered by trees, including lots of evergreens. When it’s snowing, it’s a journey through a magical corridor. I’m tired now. And it’s still snowing.